Developed by Teknopants. Published by Maxistentialism. Released December 10 2013. Available on PC. PS4/PS Vita TBA. 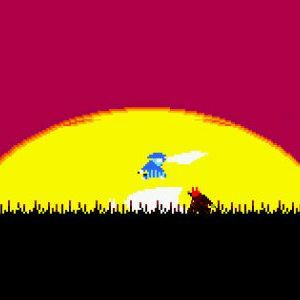 Samurai Gunn is a game deeply focused on delivering an arena-style combat experience rooted in classic arcade design. It is simple to play and understand while offering enough flexibility in the application of the player's abilities for deeply skillful play. Up to four players each control a Samurai, armed with a sword and a firearm, fighting against the other players or computer controlled opponents in arena-style stages where a single hit is enough to kill. It is a brutal, fast, and masterfully designed multiplayer offering worthy of attention. It's quite clear that, while playable with a keyboard on PC, Samurai Gunn was built for controllers (the PC version comes with settings for Xbox, PS4 and Logitech controllers pre-configured, or you can manually set them on a player by player basis). The control players have over the characters is accurate and the characters' abilities simple but potent. They are very fast, able to leap the length of the arenas, drag against walls and use them to jump from, and have a considerable amount of in-air maneuverability. Sword and gun attacks feel instantly responsive and can be aimed in four directions. The pairing of the gun with the sword is a potent one, as it allows players to be dangerous at any range, able to quickly fire off a surprise shot from across the arena to score a kill. It's also limited. Each player only receives three bullets per life, making them powerful and treasured. Keeping count of enemies' ammunition is as important as one's own, and knowing when an opponent can't cut your approach short with a shot to the face can be the difference between a kill and a death. Timing is everything in Samurai Gunn. Sword swings are quick flashes of action as useful for defense as offense. Swords striking each other will clash and propel both players backwards, while even bullets can be redirected with a well placed slash. A skilled player can keep themselves alive indefinitely in this way, but one mistake and it's all over. Variety and quality found in the arenas is a strong feature. More than thirty stages are available across four themed regions with their own enviromental elements. Roughly half of these stages come from the Forest set, where destructible bamboo grows over time and changes the terrain. Mountain levels feature hanging icicles to drop on foes, while the Cemetary has a sort of spongy mass that can be clung to in defiance of gravity. Nastiest of all are the Fortress stages with their moving platforms and spike traps, requiring extra caution to fight in lest the player wind up killing themselves in the process. The environment is frequently as much an enemy as the other players, helping to create opportunities exploitable by all. Landing in water will ruin a player's gun, with trigger pulls producing only a useless (if amusing) sputter and crippling their offensive capability. Sections of wall can be destroyed, replaced with deadly spikes to keep players from loitering in one area of the map for too long. These elements do a great job of keeping players further on their toes in an already high-stress situation. The number of players in a game also has a significant effect on the tone and pacing of a battle. One-on-one confrontations tend to be a bit more restrained and tense, as it's easier to focus on a single opponent and try to anticipate their actions. These are usually high tension matches with frequent lulls as players size each other up punctuated by blinding flashes of action. Once you get a third and fourth person into the mix, things become much more frantic and crazed. Death can come from almost any direction at any time and keeping an awareness of where everyone is at once makes for a much less predictable fight that can get the adrenal gland pumping. Impressive craftsmanship is found in the presentation. Again, the game's little touches, such as ejected shell casings which clink to the ground subtly, shine and serve to emphasize the attention to detail paid to overall audiovisual design. Blood sprays are vibrant and soak the ground, and a flash of acknowledgement accompanying each kill subtly enhances how rewarding they are. The music does its job of complementing the action with thrumming tunes which are energetic but not distracting and while it's often easy to dismiss blocky sprite designs as lazy, Samurai Gunn's are nothing to sneer at. They're crisp, sharply defined, well-animated and in service to the gameplay, providing the benefit of nigh unquestionable hit detection. Whether it's a kill earned or a death received, the result is a clear reflection of the players' skill. Two gameplay modes exist, the standard "versus" game and a "survival" option which offers a limitless supply of computer controlled opponents which become gradually overwhelming. Versus matches can be set to conclude once a player earns ten kills or to allow each player ten lives, but those are the only two options available, ruling out marathon "99 lives" scenarios or permadeath games. This setting is also found in the main options menu, rather than the game setup screen, which seems an odd and occasionally inconvenient place as it requires backtracking to the title screen. The survival mode offers an opportunity to play without needing friends (though up to four human players can still participate), and it is quite challenging. But the AI enemies have some really exploitable aspects to them, particularly their ability to climb vertically, and they probably won't be considered an adequate challenge for long. A nice touch, but obviously a secondary one. Survival mode also features a gameplay progression with five incrementing stages. The first four require the elimination of a certain number of enemies, while the fifth is simply endless. Each arena has its own set of these stages and the increments are helpful when first getting a feel for the gameplay, but soon become a tedious bore. They can't be skipped and drag out the process of reaching a difficulty commensurate with an experienced player's skill on every previously unplayed stage, which is a bit of a deterrent. 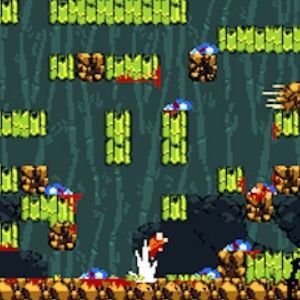 Samurai Gunn delivers a kind of competitive action rarely seen, capable of eliciting cries of "one more game." It could offer a few more options, but the quantity of content and quality in its design will provide for many a long night of couch multiplayer and intense rivalries. Bottom Line: Simple to pick up and play, the precise, tension-filled combat is capable of turning friends into bitter rivals. Recommendation: A good purchase, provided friends are around to play with.